The adventure garden ... an artist’s impression. A 20,000-sq-m new concept store that promises a sensorial experience over its three levels is set to open its doors next month (November) at Abu Dhabi’s prestigious Yas Mall. Tryano by the Chalhoub Group will host a wide variety of beauty products, handbags, accessories, and children’s products in the UAE. The space will also house a new Parisian restaurant concept called Patisserie des Reves and a spa for women and children. “Tryano has been designed to make shopping entertaining,” says a spokesperson for Chalhoub Group. According to him, the core values of the store of being vibrant, entertaining, specialised and remarkable have been embedded into the store design. 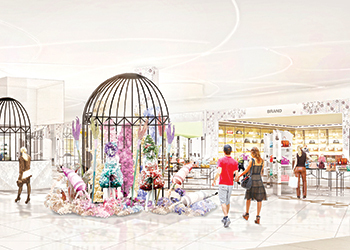 The design concept of Tyrano is based around ‘a garden of imagination’, using the seasons to reflect the product categories and innovative visual merchandising techniques to bring the store and the products to life. The seasons take centre stage, acting as host to each of the store product categories. “Tryano is being created to be a complete sensorial experience. The overarching theme is one of a beautiful garden: the seasons take centre stage, acting as host to each of the store product categories which are laid over three floors. “Set to become a concept store and an iconic retail destination, the innovative interior store design created by London-based retail architects HMKM promises to be an entertaining environment and a visual surprise, with new-to-the-region display techniques and some world exclusives in terms of retail design,” says the spokesperson. 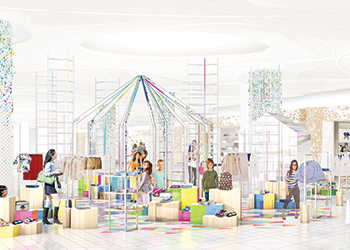 The children’s floor will include an interactive, educational and fully supervised play zone, making shopping easier for parents. The store will include clothing, shoes, accessories and toys, with a focus on children aged between three and 13 years. 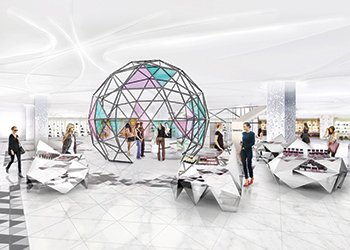 In addition, the ground floor will be dedicated to some of the world’s most exclusive fragrances, skincare and international handbag brands. “It will sit alongside some of the region’s exciting new designers, providing an unparalleled retail experience for all,” he says. Patrick Chalhoub, co-CEO of the Chalhoub Group, comments: “We are excited about the opening of Tryano, a new concept store answering once again the demands and expectations of our consumers and filling a gap in the market with choice, width and depth. Sculpture Garden ... a design feature. Work on the project commenced in the last quarter 2014 and will be completed this month. “We are very thrilled with the way the store concept is coming to life. The project is on track for an official launch in November,” the spokesperson adds. According to the spokesman, the challenge in implementing the project lay in “having multi-cultural teams working together and liaising with each other, and in getting the best material on time without compromising on the quality”. Chalhoub Group is a leading partner for luxury across the Middle East. Over the past 60 years, it has built brands in the region with passion, becoming a preferred partner for many international brands. Today, it has more than 12,000 employees and operates in 14 countries, with over 650 retail outlets across the region. The company, whose activities are focused on retail, distribution and communication, has partnered with major international brands through franchises and joint ventures. It has also developed its own concept stores to fill gaps in the market.